fish tacos on fresh flour tortillas, originally uploaded by aarn! +9th January, 2009+. got 1-lb of fresh caught and skinned ocean pollock from the new deal fish market, cut it into four equal sized pieces (one for each taco, more pieces = more edges = more crunch), breaded it in a dry-wet-dry of flour, lots of fresh cracked pepper, salt, some cumin and nutmeg, then into the egg, then back into the flour, then straight into a hot frying pan with a little canola oil. 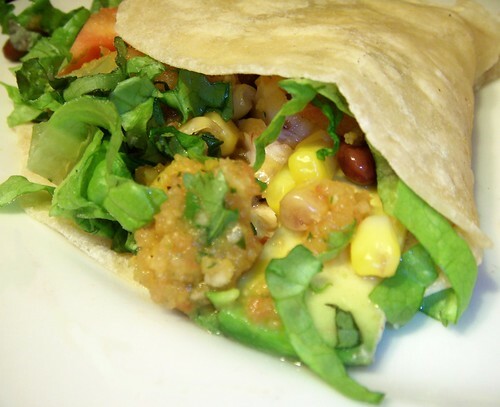 browned on each side, then sliced up and placed on a tortilla with some lettuce, black beans, corn, cilantro, mango salsa, and some seasoned greek yogurt. making fresh flour tortillas is easy. mixed 1 1/2c. flour, 1/4t. salt, 2T. butter (used earth balance), cutting in the butter until mixed. then added 1/2c. warm water and worked until about the consistency of a wet bread dough. let sit at room temp for a while, then sliced into 6-8 sections and rolled into rounds on a floured cutting board with a french rolling pin. placed each rolled and floured round in a dry frying pan on medium heat, browning both sides. put them in a covered baking pan in a 200-degree oven with the warm plates while the rest were finishing cooking. takes about 5-min per tortilla.